The 30th annual Bluebonnet Express will be held on March 31, 2019 and will start from Waller ISD Stadium in Waller, Texas, 45 miles NW of Houston. This fully supported ride is one of the Houston area’s oldest rides and is presented by Northwest Cycling Club. Three different distances/routes will be offered, traversing both South and North of Hempstead staying mostly on country roads. Cyclists will encounter both flat sections and gentle rollers. This BP MS 150 recommended ride is only a few weeks before the MS 150 which makes this an excellent training opportunity. 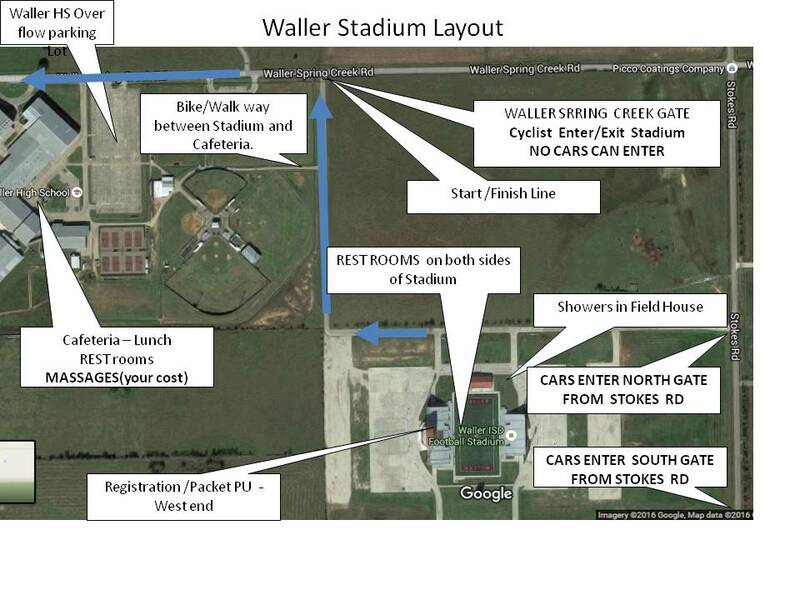 Location: New Waller ISD Stadium on Stokes Road at Waller Spring Creek Road, Waller, Texas, one mile north of Hwy 290. Take Waller Tomball /FM 2920 exit and take Stokes Road north off Hwy 290 feeder for approx. one mile to stadium. Follow parking attendants. DEADLINE TO REGISTER AND RECEIVE THE RIDE T SHIRT IS SUNDAY MARCH 14, No shirts for walk up registrations. YOU MUST REGISTER BY SUNDAY MARCH 14 TO RECEIVE A TSHIRT. Fees: $35 - $45 . You may register on site on the DAY-OF-THE-RIDE - FEE IS $50.00. Jerseys are a seperate purchase from this registration, the deadline to purchase jersey is Feb 12th so that you receive delivery before the ride. - Helmets required!! No IPods or headphones!! Riders must average 11 MPH including stops to complete the 72 mile route. Don't forget that lunch is included! You'll want to replace all those carbs with a delicious lunch. Pita wraps, soup, and salad. · Announce and/or use hand signals for changes in direction or speed. · Announce or signal road hazards to other riders. · Announce “slowing” or “stopping” when approaching intersections. · Scan, look behind before changing position. · Pass on the left announcing “on your left”. If you need to pass on the right clearly say “on your right” since this is an unusual maneuver. · Watch for approaching traffic as well as traffic coming from rear. Inform others by calling out “car up” or car back”. · Move off the road to stop. HELMETS REQUIRED. NO Earphones/iPods WHILE RIDING. Lunch from 11 am until 2 pm served INDOORS at Waller HS cafeteria. Cafeteria is located immediately West of Waller Stadium. Enjoy lunch: Menu TBA. Location is new Waller ISD Stadium located just 1 Mile North of Hwy 290 on Stokes Rd. It is located 25 miles North from Beltway 8/Hiway 290. Exit at Waller Tomball / FM 2920 continue on feeder and turn right (North) on Stokes rd and go one mile. If you have picked up your registration on Friday at NWC shop, You may want to consider parking at Waller High School to avoid the traffic at the stdm. To get to Waller HS exit at Field Store Rd(next exit past FM 2920) Go North to HS and turn right on Waller Spring Creek Rd. You may park in HS Parking area just East of HS by the Ball fields Note: NO Packet PU here. Only parking. Your car will also be next to cafeteria and lunch. Use of the showers at the Stadium Field House will be available. Bring your towel and soap! !